Barbara Flinn, our Cedar Hill activity director extraordinaire, is retiring March 29th after 20 years and 27 days of service. 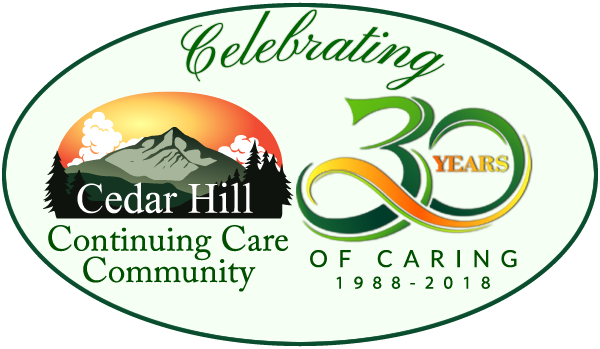 For most of those 20 years, she was the Director of Activities at Cedar Hill Health Care and Victorian House, taking a three-year break to be the Executive Director of the Village at Cedar Hill. Barb won the Health Care Association’s Activity Director of the Year award and has been an active member of the Association’s activity director’s education group. She is also a certified Activity Director, a Certified Dementia Practitioner AP-BC, Activity Professional – Board Certified. How did you come to work as an activity director at Cedar Hill? She looked at me and said again “Do you want the job?” I said “yes.” She said, “Well, it’s yours.” So in about 20 minutes, my life changed. I was the activity assistant working Tuesday to Saturday, 9 am to 5:30 pm. Sheila Minkler was my boss. I worked for her for about a year before she retired to Florida. When that happened, I got kind of antsy. I said to Mary Louise, “Now what?” She said, “You are the activity director now.” Everything just fell into place. How has the program changed? We have come a long way in developing the program. We went from offering it six days a week, from 8 am to 5:30 pm, to 7 days a week, 7:30 am to 8 pm. Our staff went from two people, including me, to six people – some full time and some part-time. We continue to have all the unusual animals coming through the facility – mini donkeys, alpacas, baby lambs and goats, birds, bunnies, baby chicks, horses and mini horses, chickens, roosters, cats, dogs. Our visiting entertainers – musicians, magicians, VINS, school groups – have improved. Responsibility and regulations have grown. We are more tech savvy. We offer ‘skyping’ to families. We have a Kindle and a laptop for short-term residents. We have worked with schools and book authors online via Skype. We have added a chaplain. Connie Moser was our first and now we have Rev. Janice. Others ministers visit as well. We started gardening. We started fair week. We make fried bread dough. We have a popcorn machine. We started memorial services for families and residents. We still can’t get away from bingo – so many people love it. The point of activities is to give people a purpose. If you want to bake, we say, “let’s make a cake and you are in charge of it.” Sometimes residents don’t want to get involved but they will wander out and we help them to make friends and connections with others. With a short term resident recently, I gave him a hand massage and then he said, “Can you do my feet?” He had stayed in his room all day but after that, he started coming out and participating. It made his time with us more meaningful. For other people, it is connecting them with a pastor, or taking them for a walk outside, or going for a ride. I bring one resident the Vermont Standard every week so he can keep up with his former community. It’s that extra we do that gives our residents an extra special feeling of belonging and being loved. Do you have any moments that really stand out to you? When we connected two of our residents with the author of “The Shack,” William Paul Young, via Skype. One of the residents was 102, and she was able to get closure on some things in her life at 102. She worked through issues with God. I am very proud of my certifications. 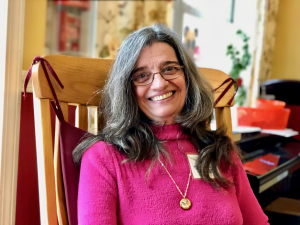 Cedar Hill – you and your Mom – pushed me to get my certifications and to get more involved with the Vermont Health Care Association and other groups. That has meant a lot to me. One of our LNAs brought in a stuffed dog for one of our residents. She brought it in because she knew it looked like that resident’s girlfriend’s dog that he loved. When he had to go to the hospital that dog went with him, sitting on top of him. Every employee has a connection with one of the residents, for whatever reason. They give our work a lot of meaning. I hope I have made a difference in people’s lives – they have certainly made a difference in mine. My Mom told me how proud my Father would have been to see what I did with my life and my work. I went down a road that was meant to be. I had a mission. It took me a long time to find that mission – I didn’t start working in activities until I was 44. You have managed a lot of employees over those years. You have many employees who stayed for years. I didn’t want to just be a boss, but a part of a team. I wanted to be someone my staff could turn to if needed and confide in when they needed so they could focus on their job. I hope I helped guide them in a positive way. In this business, you are more than just your department. I always try to go out when the nurses are stretched and help out staff outside of my department. I keep candy on the desk. I give people hugs. I ask if they need to talk. My staff goes in whatever direction is needed. Your department is particularly involved with the families. When we take in their loved ones, we also take in the family. We need to be supportive of them as well. It is important we make the families feel welcome and loved and supported. After her mother died one family member said how much she cherished the memory of going on the Sunapee boat trip with her Mom on one of our trips. It is important to get both residents and families comfortable to open up to you, so they don’t feel alone. You don’t realize until you start looking at retiring how much more it is than just a job. The Department is a part of my family, heart, and soul. I am hoping that when I am not here, I will be remembered for the good things I did for the staff, the residents – everybody. I learned so much from working with Mary Louise, watching her as an owner and the pride she took in Cedar Hill. Your mother taught me that if you see a cup on a table, pick it up. Pick up what is on the floor. Wipe up the water. Straighten the picture. Clean up after people. Those little things that need to be attended to – the little things that add up, that show that you take pride in your work environment. I would like to thank her for believing in me enough to hire me, promote me and foster my profession. You did that as well for 10 years. I want to thank you also for believing in me.